PLO announces first batch of documents on 'settlements, Gaza and prisoners' to International Criminal Court. The Palestinian Authority has officially submitted the first batch of legal documents to the International Criminal Court in its attempt to have Israel prosecuted for "war crimes." The Palestine Liberation Organization's official Twitter feed posted pictures of some of the hundreds of documents it said were "just submitted" to the ICC at around 4 p.m. Thursday. It said the documents were concerning "settlements, Gaza and prisoners." Earlier Thursday, the PA's ambassador to the Netherlands told the Bethlehem-based Maan news agency that PA foreign minister Riyad al-Maliki was set to lead a delegation to the Hague to personally submit the documents at around 3 p.m., while acknowledging it could still be many years before the case was actually heard even if it is accepted. "It will take the ICC a long time to take action, possibly 5-10 years as this is one out of a hundred steps," Nabil Abu Zneid said. The PA's legal case is being drafted by "five senior international lawyers," according to Maan. Ahead of the move, on Wednesday morning Palestinian National Initiative party head PLO Central Council member Mustafa Barghouti said the PA's goal "is to prove war crimes were carried out so the chief prosecutor will launch an investigation." He added that the PLO was looking to remove the immunity of "Israel and its leaders" and put the state on trial. "We are working for the restoration of justice, implementation of human rights, protection of Palestinians and the prosecution of those responsible [for violating these these thing]," Barghouti stated. "The documents presented to the court relate crimes and war crimes committed by senior members of Israeli leadership," the PLO announced, arguing there is a deep connection between "crimes carried out in the settlements and attacks on civilians in Gaza." The PA's attempts to prosecute Israel at the ICC are part of a wider diplomatic offensive against the Jewish state, which began after the PA walked away from peace talks last year. 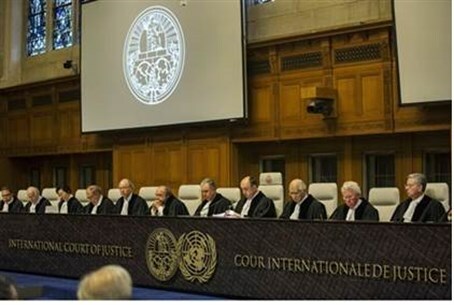 Israeli political sources told Arutz Sheva on Wednesday that the Jewish state does not intend to cooperate with the ICC given that it has never recognized the authority of the court. However some Israeli legal rights groups have warned that if the PA goes ahead with its attempts to prosecute Israel, they will launch criminal proceedings against the PA, Hamas and other terrorist groups. There have also been calls to dismiss the ICC's Chief Prosecutor even before the case begins, over allegations of her alleged anti-Israel bias.